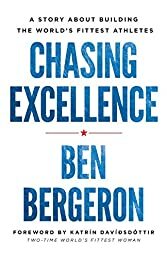 Using the dramatic competition between the top contenders at the 2016 Reebok CrossFit Games® as a background, Ben explores the step-by-step process of achieving excellence and the unique set of positive character traits necessary for leveling up to world-class. The mindset and methodology that have produced some of the greatest athletes in the world's most gruelling sport can work equally well for golfers, lawyers, artists, entrepreneurs--anyone who's willing to commit totally to becoming better than the best. By Chasing Excellence, you'll discover how extraordinary it's possible for you to be.